Hey guys! 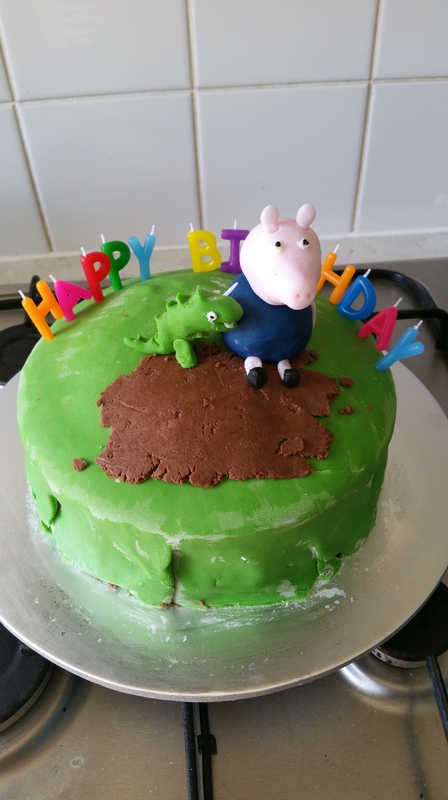 So my gorgeous lil man turned two there three weeks ago and as a Peppa monster I decided to have a George Pig themed birthday party. I know, I know, some people may scold my frivolity here with having a theme and all that, but that’s how I roll…for now. I think I managed quite well but there actually is very little George Pig themed stuff out there. Here’s what I did…. I got these personalised George invites off ebay. These were probably my most expensive purchase and if I was computery I could have made them myself but I’m not, so here we are. They were really good quality though on a heavy card with blue envelopes. 10 for £4.49 inc free p&p. I did have to doctor them though as I had to change the party date at short notice with no time to order more anyway. As it was more a picnic than a party and rather than trying to cart lots of trays to the park, I decided to do lunchboxes for the kids. 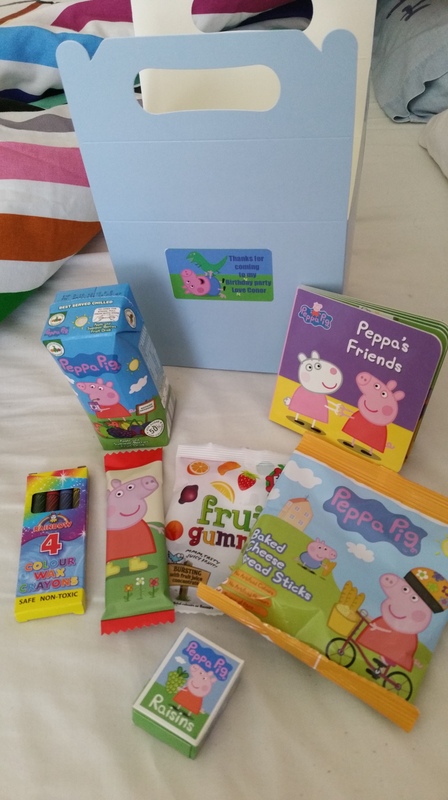 Now you can get really nice actual Peppa Pig ones from Ebay but I found them a bit more expensive, so I ordered plain blue boxes (10 for £2.99 inc free p&p)and personalised George “thank you” stickers (21 stickers for £1.99 inc p&p) instead. So in each lunchbox I put a Pig themed box of raisins (12 for £1 @ B&M), a bar of chocolate (2 x6 for £2 @B&M), a packet of breadsticks (2×6 for £2 @ Poundland), a packet of jellies (2×6 for £2 @ Poundland) and a carton of juice (8 for £5 @ Tesco). I also included a Peppa book (Peppa Pigs Mini Library contains 6 books,normally £4.99 each, got them from The Book Depository for £6.14 inc del on special offer), some crayons (8 for £1.99 inc p&p) and I found some free George pics on the net which I got my friend to print off and created a colouring book. As there was also 3 pretty much, brand spanking new babies attending, I felt a bit guilty with them not being able to eat so Asda had these Little Tikes block teethers for £8 and I bought them to give them one each. I just used clear lunch bags, some ribbon and a “thank you” sticker to package them. 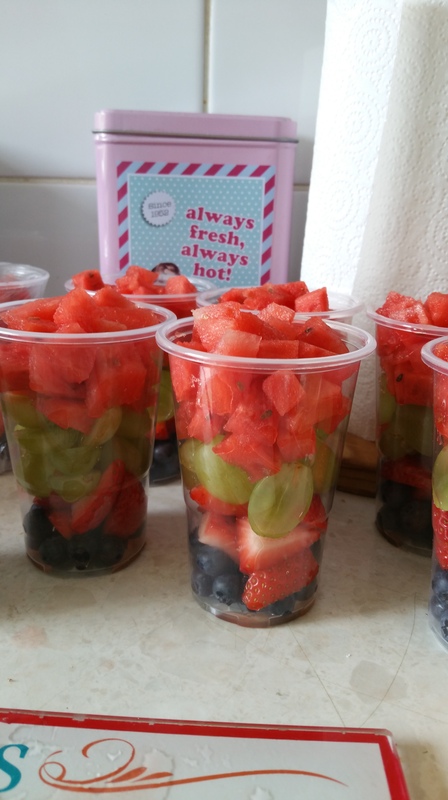 I find that a lot of toddlers aren’t to big on sandwiches….well the ones I know, so I made some fruit cups up, using blueberries, grapes, melon and strawberries. This cost about £7 inc the cups and made 12 servings. I also made a big bowl of tomato and sweetcorn pasta which cost about £2 in total. I made up a tray of chicken salad sandwiches for the adults (which cost about £5) and took along some fruit cordial and bottles of water. Ooh I also had some breadsticks (Asda x2 98p) and Pom Bear crisps (2×6 for £2 in Poundland). I cheated a little and bought pre-made buns (2×12 £1.78) and decorated them myself using Betty Crocker vanilla butter cream (£2 on offer) icing and edible George rice paper toppers (30 for £1.50 from Ebay). My Ma used to always make our cakes so I want to continue the tradition although I like less hassle so I bought cake mix (2 for £2 @ Asda)….hey it means less wastage too you know! Asda also do big blocks of ready coloured icing @ £1.69 per pack. I bought the main colours I needed, my friend supplied some too. The cake mix was a doddle and was supervised by Ash so thankfully didn’t burn. I used the Betty Crocker as before and some jam as the filling for the cake. The picture of the cake is pretty self explanatory. George & Dinosaurrr were held together and in place using toothpicks. the muddy puddle was melted buttons. I’m really proud of how it turned out. I bought some brightly coloured party plates, bowls and napkins (£3.80 B&M). I also bought 10 bubble swords (10x50p £5 @ Morrisons). The bunting was £2 from Poundland and the balloons were from Ebay (20 for £1.98). I also actually spent £3 on a prize for pass the parcel but forgot to take it along with the bubble machine which we had anyway. My sister bought a football and frizz bee to take along too. 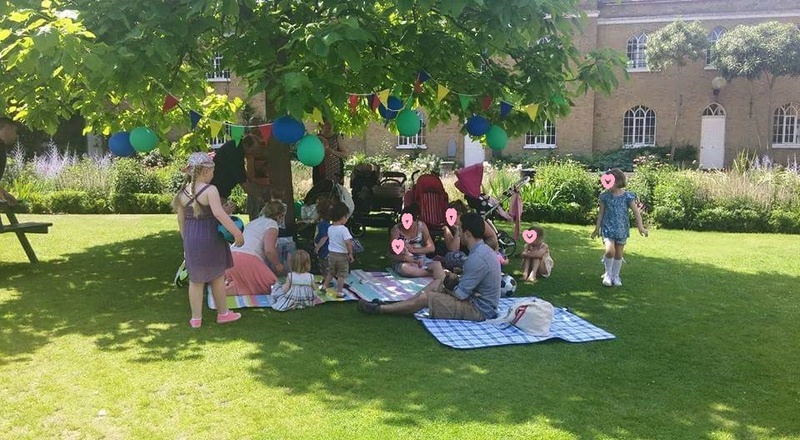 It’s the height of Summer, it’s baking, my flat and myself couldn’t deal with that many people indoors on a day like it was so I invited everyone to the local park. Burgess Park has a really nice, world garden enclosed within some old Alms houses and we managed to set up camp beneath a tree there which was ideal. There was shade and as it’s enclosed there’s a lot less chasing of toddlers to be done, it was almost like a private picnic in the end. Also just outside this particular sight is the cafe, the loos, the playground and parking is a short walk away. 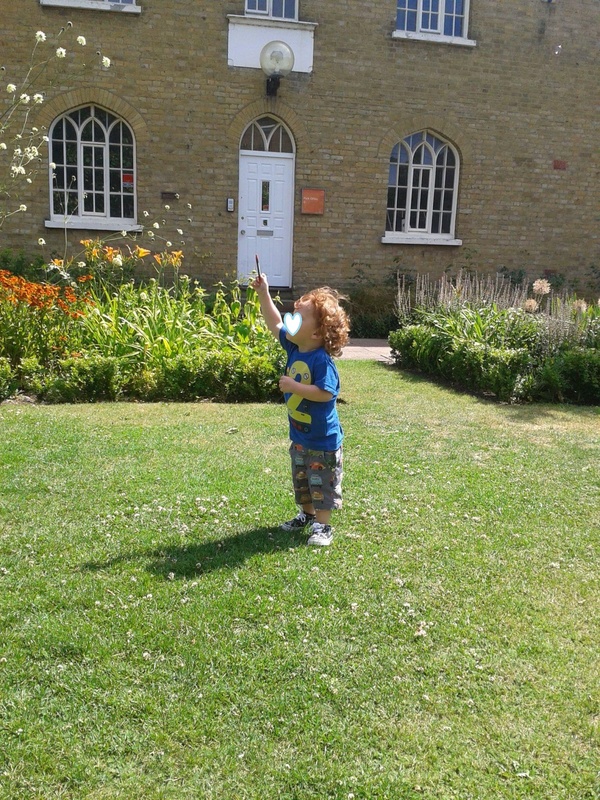 GRAND TOTAL: £78.64 this included no crying or fighting, the joy of the great outdoors and a really lovely day. I think I did pretty well here and I think everybody enjoyed it. I know people who do go all out, hiring halls and characters, ordering super duper cakes and fair play to them if they can, but, personally for a two year old it’s the simple things they like the most. I hope this post inspires some of you, please drop me a line and let me know what you think or about your parties. < Previous My Charity Shop whinge!